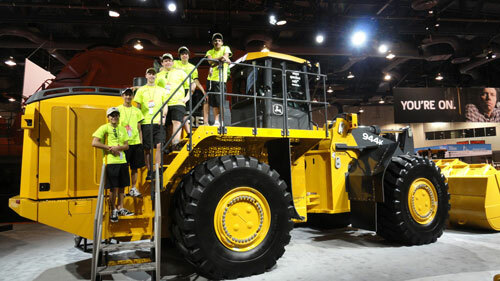 To help educate students considering careers in the construction industry, John Deere Construction & Forestry sponsored a team from the Bartlett, Ill., High School Academy of Science and Engineering in this year's Association of Equipment Manufacturers (AEM) Construction Challenge. The event, now in its fifth year, was held recently in Las Vegas at ConExpo, the construction industry's largest trade event. The AEM Construction Challenge is a career-education initiative designed to help develop the construction workforce of the future by providing real-world experiences that inspire students to explore and pursue careers in the construction industry. This is the third year John Deere Construction & Forestry has sponsored a team through its C&F Tech Program. The program is a partnership between Deere, its dealers and select community colleges around the country where students can earn a degree and work in a dealership to use the skills they've learned. It includes a curriculum that focuses on the specific skill sets and knowledge involved in being a Deere technician. Before the showdown in Las Vegas, teams of five to seven students, along with an adult team manager, competed at nine regional rallies across the United States. The top 24 teams advanced to the championship finals in Las Vegas. Through their participation in the competition, all students learned a great deal about the construction industry, and they developed problem-solving and hands-on construction skills in a team environment.